This genus has only 3 species. Eupomatia laurina (pictured) is the taller with the slightly bigger rounder fruit, while Eupomatia barbata is a smaller shrub. They may have a slight zigzag pattern to the branches. 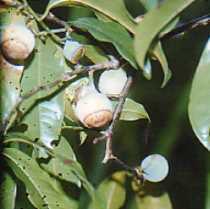 The primitive flowers appear only for a day, and are followed by very distinctive cup-shaped, flat-topped greenish fruits that look a little like gum nuts. There are a couple of examples of the first species along the Kulki boardwalk at Cape Tribulation that may be noticed when fruiting.